Why can having the Holy Spirit in one's life bolsters one's faith in God? Peter talks about how Jesus is not a fable. The resurrection of Jesus Christ and everything else that Peter saw during His ministry, he bears witness to the Resurrection as a real event. Nathan Jones: Exactly, the Apostles were there with Jesus and were first-hand witnesses. They touched Jesus. They ate with Him. They slept nearby Him. They followed Jesus as their rabbi. They knew Jesus is the Messiah firsthand. They heard the voice of God the Father at the Transfiguration say, "This is my Beloved Son in whom I am well pleased." They were first-hand witnesses who were willing to die for that testimony. Peter is saying here in this passage that he is not making up stories. Jesus is the real deal. The Gospel of Jesus Christ is the truth. Because Jesus is the truth, it is very important that we take His message seriously. Vic Batista: That is why I really love this passage, because there is so much to learn for being such a short book. Second Peter is packed with powerful truths regarding who Jesus is as the Son of God, about how He came as a man and walked among us, about how He lived His life while on earth, and how one can have a relationship with Him. Peter had a great appreciation for those struggling in their faith in God, because he was the one who denied Christ when the pressure was on. And yet, we read about what amazing feats of witnessing and miracles God accomplished throughout Peter's life. Nathan Jones: Yes, Peter denied Christ three times at His trial, which is ironic, for Peter was always the most adamant of Jesus' disciples. He was the one who was always sticking his foot in his mouth. He was also always the first one to step out in faith. Out of all the Apostles, Peter had the greatest faith, because he was the only one who stepped out of the boat when that storm was raging as Jesus was walking across the water. Peter had the most faith, as much as a man could. But, once the Holy Spirit took control of Peter's life after Jesus ascended to Heaven, then Peter — the poor fisherman who was always sticking his foot in his mouth — became one of the most powerful orators. We read how at the day of Pentecost, when the Apostles had the Holy Spirit come upon them, that they went out preaching in different languages. All of a sudden, Peter was giving speeches like he'd never given speeches before. The Holy Spirit totally transformed who he was. The people who knew Peter were witness to the fact that he had changed as well. And, when we look at even Christians in our day and age, we can see a tremendous transformation from who they were before they got saved to who they are now. Vic Batista: We also notice that something phenomenal happened to Peter. When the Holy Spirit came upon him, He transformed Peter into a different person. That is why people need to be baptized in the Holy Spirit through salvation, because they experience a transformation when the Spirit of God comes upon them. I often say that the baptism by the Holy Spirit is a baptism of equipping power that all believers need. Nathan Jones: Exactly! There are times when I'm preaching at a church or conference. As a preacher, Vic, you know how you can kind of separate from yourself while you are speaking and listen to yourself as if in third person? There are times when I'm thinking, "Wow! This is really good material. But, this can't be me, for I'm definitely not this good." It's that the Holy Spirit has taken over and you are preaching your heart out and people are getting excited about the Lord. Then the small voice in your head, which is your subconscious, is saying, "I'm not doing this." You just know. Those are those moments when I really feel close to Jesus, because I am giving myself over to be an instrument for Him to share the Gospel. And wow, it is so amazing! It is kind of a glimpse into what Peter and the other Apostles must of felt when the Holy Spirit came upon them and gave them the ability to preach and teach like they've never done before. Vic Batista: What a great point! And that power is available to all who are saved. Maybe there is a Christian who thinks they could never have the faith like Peter. Well, yes, you can because that same power is available to everyone by the Holy Spirit. Nathan Jones: Once you're saved the Holy Spirit dwells within us. God gives us His Spirit, whom He calls the Counselor, and the Counselor comes and guides us through our life. We may have our own conscience, but the Holy Spirit helps us when our conscience gets kind of smothered because we want to do what we want to do. The Holy Spirit makes sure we feel guilty about whatever we are doing that's wrong. He also guides us in discernment in making the right choices. And, the Holy Spirit empowers us when He wants us to share Christ with other people. Because this indwelling by God is a real thing, that's why Christians are willing to die for their faith. Faith isn't something that we read in a book and conclude it's just a good story. We know Jesus first-hand through the Holy Spirit. I hope if the day does come that my faith is tested in a life-or-death situation that I would be willing to die for Christ. I believe I would because I know 100% that Jesus Christ is the real deal. Vic Batista: We need the power of the Holy Spirit more than ever as we do see the day of the Lord's return approaching. Vic Batista: Second Peter 1:18 says, "And we heard this voice which came from heaven when we were with Him on the holy mountain." How awesome that the Apostles Peter, James and John heard the voice of God. God wasn't a fable, He is for real! Nathan Jones: They heard the very voice of the Father Himself. Can you imagine that? They heard the very voice of the Creator of the Universe. I am looking so forward to the day when I get to meet God face-to-face and see what He looks like and hear what His voice sounds like. We read in the Bible that His voice is like the rushing of a thousand Niagara Falls — the power of it is so amazing! Our feeble earthly bodies cannot stand before God, but in our glorified bodies which we'll get in Heaven, we'll actually have the strength to see and hear God. Then we can have fellowship with God just like Adam and Eve did in the Garden of Eden when they walked and talked and personally knew Him. God has been working hard in bringing mankind back to the Garden of Eden so that we can have that fellowship once more. That one-on-one with God is what I am looking forward to. Vic Batista: And, I believe soon and very soon we are going to see that happen. I am very excited! 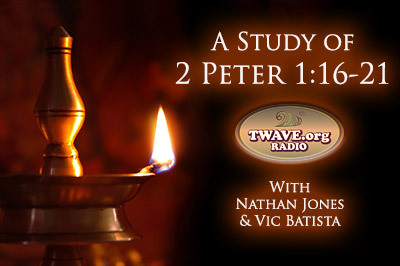 In the fifth segment of our study of 2 Peter 1:16-21, we'll look at why Bible prophecy can be compared to a bright light.